Home Page › Blog › Can a Pit Bull Be a Service Dog? There are approximately 18 million Pit Bull-type dogs in the United States, (or 20% of the dog population). The “Pit Bull,” however, is not a definitive breed, but rather a catch-all term for any dog that exhibits the appearance of this bully breed (not necessarily its genetic makeup). In general, there are four breeds widely referred to as the “Pit Bull.” These include; the American Pit Bull Terrier, American Staffordshire Terrier, American Bully, and the Staffordshire Bull Terrier. These breeds are similar and do share some common characteristics, which could be why they are commonly confused for one another. 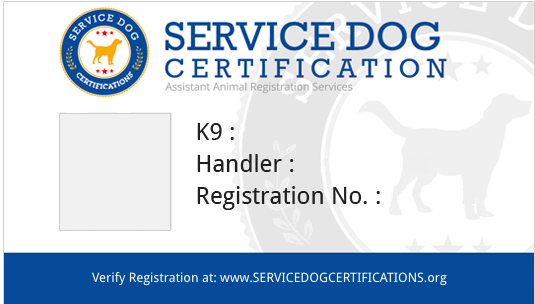 In this post, we will explore the American Pit Bull and answer the question of; can a Pit Bull be a Service Dog? Unfortunately, over the years, unscrupulous people have given the “Pit Bull” a bad name. These dogs have gained the reputation for being vicious killers out for blood. Nothing could be further from the truth. A well-bred “Pit Bull” is friendly, loving, and a devoted companion. They have no idea of their size and believe that any lap is an opportunity for love and affection. The Pit Bull is a sturdy, energetic dog, that is very tolerant of children. However, as with any dog, early socialization and exposure to different sights, sounds, people, and other dogs is highly recommended. Because of its need for love and affection, the American Pit Bull does not do well when left alone for extended periods-of-time. American Pit Bull Terriers have a great need to chew. They also have powerful jaws that can (and will) make quick work of cheap or flimsy toys. Be sure your Pitty has only tough, durable toys that can’t be chewed up and swallowed. American Pit Bull Terriers are best suited to owners who can offer firm, fair training, and gentle, consistent discipline. Characteristics: Pit Bulls are known for their loyalty and eagerness to please. This makes them a wonderful candidate to be trained as a service animal. Despite the stigma attached to the Pit Bull, they do make excellent Service Dogs. They are large enough and strong enough to pull a wheelchair, as well as offer physical support for those with balance or mobility issues. Their loyal, dedicated, and intuitive nature makes them a natural for offering emotional or physical comfort for those individuals with psychological or psychiatric conditions like PTSD, depression, or social anxieties. The American Pit Bull can also be trained to be a Medical Alert Service Dog. These animals respond to various health issues such as low blood sugar, oncoming seizures, or low oxygen levels. They can also be trained to remind people to take their medications. Due to the misconceptions of the Pit Bull breeds, many regions have imposed a ban on owning these dogs. 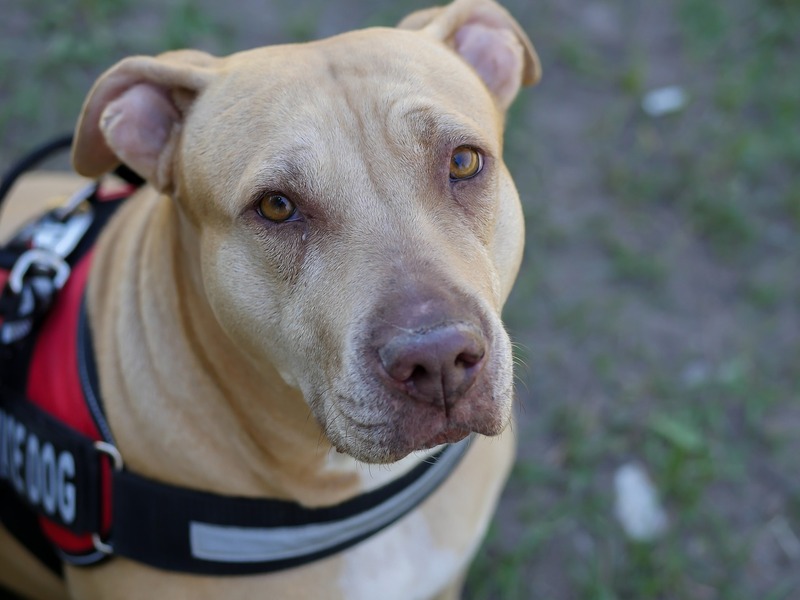 However, according to the Fair Housing Act, it is illegal to discriminate against a person owning a Pitty breed when it is used as a Service Dog. There are also two organizations on a mission to change the stigma of the Pit Bull breeds. The Animal Farm Foundation’s Assistance Dog Training Program (New York) trains shelter Pit Bulls to push wheelchairs and to help people regain their mobility and avoid falls. It’s believed to be the only American training school that exclusively trains shelter Pit Bulls to be service dogs. Can an American Pit Bull Be a Service Dog? The American Pit Bull (and all the Pitty breeds) can make excellent Service Dogs. However, like any other dog, early socialization, proper training, and positive reinforcement all work together to create a well-rounded canine. Service dogs are entitled to public access rights with their handler. This means that you and your service dog can go anywhere that you are allowed to go – like office buildings, stores, no-pet apartments, etc. If you think a Pit Bull is a breed that will work best for your disability, be sure to seek out a reputable breeder or rescue organization. Get all the information you can on the specific dog, then go to work training it up in the ways of service. I currently have been diagnosed with SEVERE anemia. With the potential possibility of passing out, I am unable to drive anymore either. I have ALWAYS loved the breed. I would love the potential of having this breed to protect me, and look out for me. My daughter has a pitt/mastiff mixed. She learned quickly and is one of the most obedient dogs I have ever encountered. She is a pleaser and absolutely adores being loved by others. Pitts make exceptional service dogs because of their dedication and eagerness to please. My daughter is a dog trainer and recommends that ALL dog breeds be trained especially if they’re to be family pets…socialization is so important.